Common reed has become a destructive weed, quickly displacing desirable plant species. Its high biomass blocks light to other plants and occupies all the growing space below ground so plant communities can turn into Phragmites monocultures very quickly. Invasive stands of common reed eliminate diverse wetland plant communities and provide little food or shelter for wildlife. Phragmites make a grassy forest. 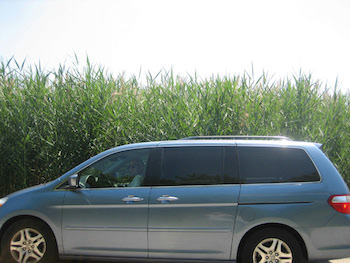 Common reed is a tall, perennial wetland grass ranging in height from 3 to 20 feet. Strong, leathery horizontal shoots called rhizomes growing on or beneath the soil surface give rise to roots and tough vertical stalks. Cane-like stems 1 inch in diameter support broad sheath-type leaves that are .5 to 2 inches wide near the base tapering to points at the end. Plants produce large, dense, feathery, grayish-purple plumes 5 to 16 inches long in late June through September. The reeds turn tan in the fall and most leaves drop off, leaving only the plume-topped shoot. The root system is comprised of rhizomes that can reach to 6 feet deep with roots emerging at the nodes. 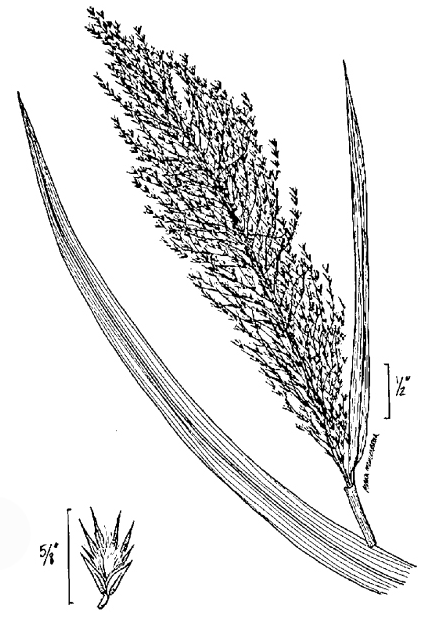 Common reed reproduces by these spreading rhizomes and forms large colonies. Common reed stems and leaves. Common reed thrives in sunny wetland habitats. It grows along drier borders and elevated areas of brackish and freshwater marshes and along riverbanks and lakeshores. The species is particularly prevalent in disturbed or polluted soils with alkaline and brackish waters but will tolerate highly acidic conditions. It can grow in water up to 6 feet deep and also in somewhat dry sites. It can be found along roadsides, ditches, open wetlands, riverbanks, lake shores, dredged areas, and disturbed or undisturbed plant communities. 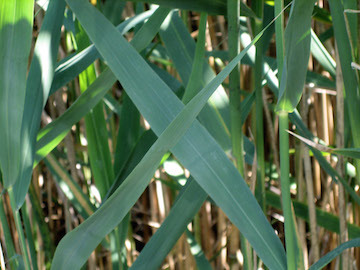 In this area, no other plant is likely to be confused with Phragmites australis although similar plants do exist in other parts of the country. It is distinctive in northeastern Illinois. This tall, plumed plant growing in a wet ditch or marsh is easy to identify. 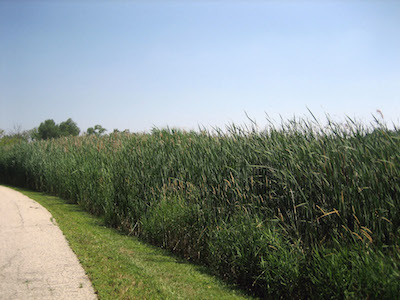 Property owners wishing to deal with stands of Phragmites australis should contact a company that is licensed to perform this type of service. If you have a very small amount of common reed, the following methods will help prevent it from spreading. You can dig up very small populations if you are careful to remove all root material and surrounding soil. You can cut common reed and dig the rhizomes, but physical control is difficult because the plant can reestablish from seed or remaining rhizomes. Frequent mowing is sometimes an effective control of common reed. Common reed can be effectively controlled with a general use herbicide such as glyphosate. Follow label directions and state requirements. If common reed is growing in a wet area, the herbicide must be one approved for use in areas of standing water. This is a job for a professional. The appropriate chemical treatment will be a challenge and may require a permit. Immediately upon removing a stand of common reed from a dry site, install replacement plants or cover the bare soil with several sheets of newspaper and wood chips. Leaving bare soil encourages other weeds to invade. 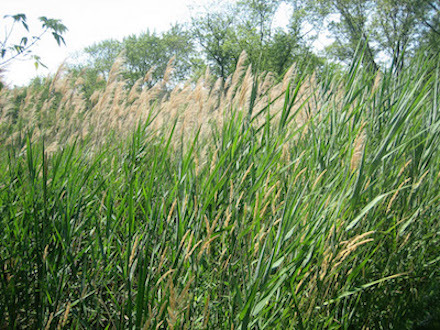 After removing common reed, replace it with a native grass that grows in the same habitat. It should thrive.